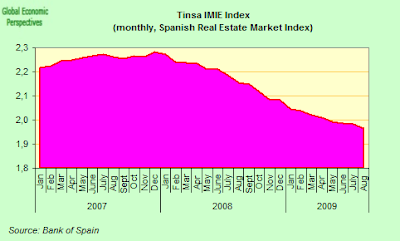 Spanish house sales were down an annual 20.3% in July, with a total of 37,039 homes changing hands. 50.5% of these were new according to data released today from the National Statistics Institute (INE). The interannual rate was thus down over June, when it stood at 25.5%. In fact, month on month sales were up 4.7%, although over the first seven months of the year as a whole there was an inter-annual drop of 33.1%. 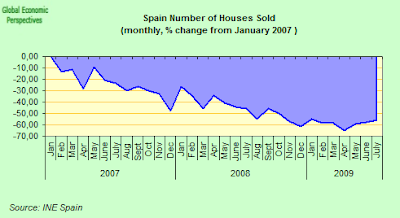 However, while it is clear that sales have been improving now since April, which was definitely the worst month to date, with monthly sales down 65.1% over the January 2007 peak, the recovery rate is very timid, and if we take into account that there must be more well over 1 million empty, unsold new houses all over Spain, and in July there was only a net difference of 18704 homes (50.5%) or about 1.9% of the total, then across Spain as a country about 374 houses per Spanish province were sold. At the current rate, it would take 1,000,000 / (18704 x 12) â‰ˆ5 years just to get back to the starting block, and this with no new homebuilding at all between now and 2015. And if we were start to think about migrants who change country, young educated Spanish people who emigrate in search of work, and residential tourists who simply give the keys back and go, then as long as there are more than 374 immigrants/residential tourists leaving each province each month, the Spanish housing market will simply be treading water. This is the very high cost which could be attached to having that “L” shaped non recovery which the irresponsible government “non policies” risk inflicting on the Spanish people. And even after all this is said, in July monthly sales were still down 55.75% from their peak. The improvement evidently reflects growing pressure on people to sell, at prices which are still dropping by the month, and where the total quantity of funding available for mortgages remains more or less stationary. That is to say it would be rather foolish to expect any real rebound in total value realised at this point – quite the contrary. Well, this IS interesting isn’t it. It appears that things are getting better – and indeed that is the conclusion most popular press journalists seem to have drawn. Well no, actually, they aren’t. This data point is a complete statistical anomoly, based on the fact that prices have now been falling for more than 12 consecutive months, in such cases year on year data becomes virtually meaningless. Indeed the most valid measure now is the P2P one I have introduced (peak to present) since using this we can see how far the indicator moves around. See next chart. In absolute terms, the index continued to fall from the figure recorded in July 1983 to that of August 1964. 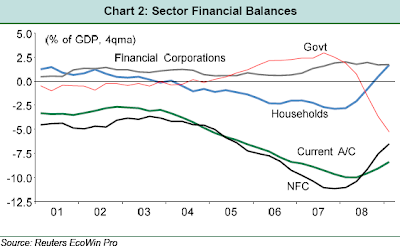 In terms of accumulated rates, the general index dropped 14% from the maximum recorded in December 2007. 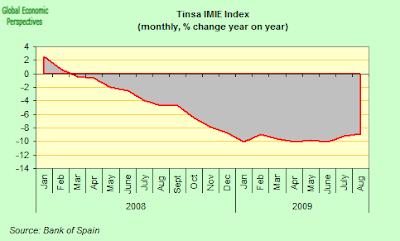 In fairness TINSA also point out that – in absolute terms – the index continued to fall in August from the figure recorded in July. 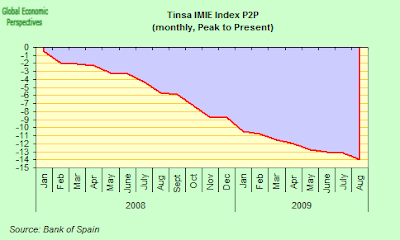 Tinsa also do report that the cumulative decine is now down 14% from the December 2007 peak. So proces are falling, and there is no real sign of easing, and indeed the only real issue is how far they will fall. My guess is 40% minimum, but others are invited to make their own attempt – as in a lottery – and we will see at the end of the day who the winning ticket belongs to. The other issue will be, once the fall stops, how long it will be before they return to only 30% below the December 2007 peak. My guess is five years after they bottom, but as I say this is pure guesswork, and is about as useful at this point as the year on year piece of data TINSA kindly provided us with. 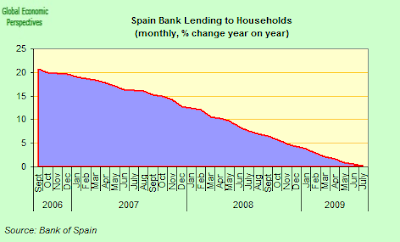 While year on year lending to households dropped to just an increase of 0.4% in July. 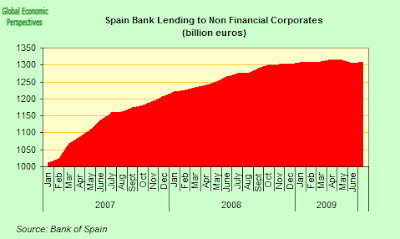 Corporate borrowing was also more or less stationary on the month in July, at around 130.9 billion euros it was up just 0.3 biliion euros on June. 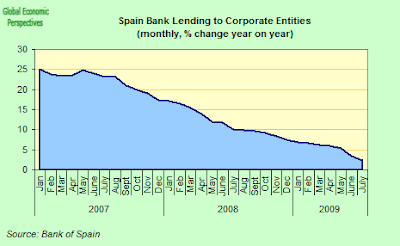 And the interannual rate of increase in corporate borrowing has also been falling steadily, and is now down to 2.4%. 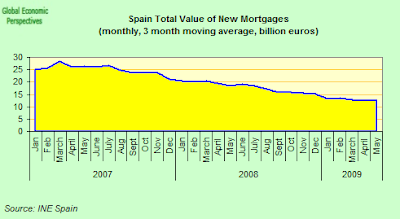 As can be seen in the chart below – prepared by PNB Paribas Chief European Economist Dominic Bryant – under the pressures of growing unenomployment and falling domestic demand both Spanish households and companies are furiously trying to put their balance sheets in order by saving and starting to pay off their their debts. Given the unsustainably high pre-crisis levels of indebtedness there is basically no alternative to this process, and this is precisely why the only way for Spain to return to growth is by increasing exports and running a trade surplus. During this process of transformation in the Spanish economy (known among economists colloquially as a correction) there is no real alternative to the government stepping in, and stepping up spending to soften the blow, and this is what we can note in the chart. 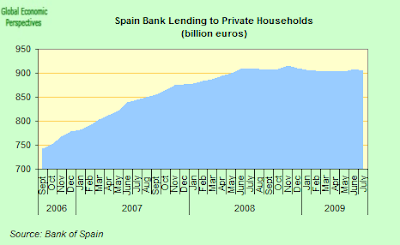 Thus the Spanish government is, like other European governments, running a large stimulus programme. The problem is, however, this money is not being spent on supporting what would otherwise be a very painful structural correction. Rather it is being essentially wasted by trying to drive straight on ahead in the hope that no such correction will be needed. This is setting off alarm signals everywhere, and is what forms the background to the pressure on the Spanish government to begin to put in place plans to structurally reduce the deficit. The urgency of the restructuring of the governments funding programme was brought into harsh relief at the start of the month when it was announced that the gap between government income and spending have shot up by 500% over the last 12 months. In July alone the gap grew by 28.7% over June, and stood at around 50 billion euros, or around 4.7% of the estimated GDP for this year. 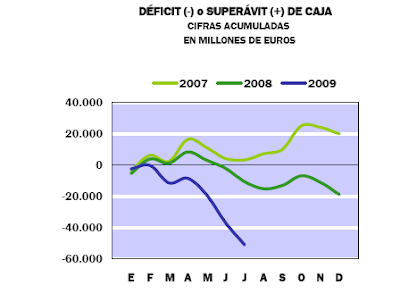 As a result of this lamentable situation Spain will now need to significantly reduce its anti-crisis fiscal spending – both between now and the end of the year and again in 2010 – if it seriously intends to bring its fiscal deficit back towards E.U. limits by 2012. Indeed Treasury Secretary Carlos Ocana openly accepted this in his statements last Friday. 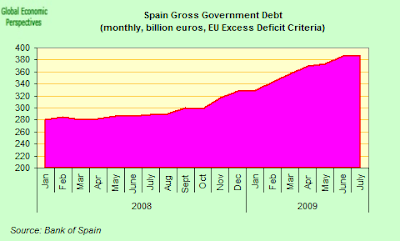 The Spanish government is likely to go for some variant of reduced spending combined with increased tax increases. And the pressure isn’t only coming from Brussels and Frankfurt, Bank of Spain Governor Miguel Angel Fernandez Ordonez is also treading on Zapatero’s coattails, arguing that Spain’s government must be prepared to adopt all measures necessary to bring down the ballooning public deficit to address soaring unemployment. The problem is, by this point in the game this will not be as easy a task as it was earlier, since Spain is now becoming trapped in the kind of spiral we have already seen operating in the East of Europe whereby cuts in spending only produce more unemployment, while tax increases weakend consumption further, accelerating the economic contraction, and again sending up unemployment. Spain is now in a lose-lose dilemma, with no easy short term options and some inevitably hard and difficult years now lying ahead. Indeed only yesterday the recent pie-in-the-sky claims by Spanish Prime Minister JosÃ© Lluis Rodriguez Zapatero, and Economy Minister Elena Salgado that they could see signs the Spanish economy was about to recover had yet another bucket of cold water poured over them, and this time from an unexpected source – European Commissioner for Economic and Monetary Affairs, and PSOE member, Joaquin Almunia – who predicted Spain would continue to remain in recession until the end of 2009. Almunia forecast the Spanish economy would shrink by 3.7 percent this year, a reduction of about half a percentage point on previous expectations, and would remain in recession into next year. My own feeling is that even this outlook could prove over-optimistic given that my current calculations best effort indicate a contraction of this year of around 5%, and even this has downside risk if the goverment are forced to cut back strongly on spending programmes. “The recession is less deep than the European average, but it is going to last longer. The reason for that is the adjustment from the disequilibriums which have accumulated over the last 10 years,” Almunia said, referring to the construction boom, external deficit and continuing reliance on ECB funding in the absence of external investors willing to offer finance to the banking system at affordable rates. Almunia’s warning has also been echoed this week by analysts at Deutsche Bank, who say in their latest report that some of the European economies who were once motors of growth and job creation for the 16-nation bloc may stay mired in recession next year. The risk – according to the analysts – is that a recovery in the largest euro nations will prompt the ECB to tighten policy before smaller countries like Spain or Ireland have reached the end of their correction, making matters far worse for economies that are still struggling with slumping house prices and surging unemployment. Any increase in interest rates will make it harder for governments and consumers to pay interest on their mounting debt, potentially pushing their borrowing costs higher. â€œThe ECB will have to normalize rates from next year and it will hurt countries like Spain and Ireland which will still be in recession and burdened by piles of debt,â€ said Gilles Moec, an economist at Deutsche Bank in London. He forecasts the ECB will double its benchmark interest rate, currently at a record low of 1 percent, by the end of 2010. The OECD has also warned that Spain and Ireland, where households are already among the most indebted in the euro region, will contract 0.9 percent and 1.5 percent in 2010 and will also post the euro area’s largest budget deficits. In contrast, says the OECD Germany and France will both expand by 0.2 percent. While it is bad with over one million unsold new houses there is an even greater problem with the 4-5 million empty homes that was bought on speculation. Spanish citizens and residential foreigners take up 16,7 million homes and the tourist industry uses about 300- 400 000. It exist 23 million homes in Spain! A gap of six millions not one! 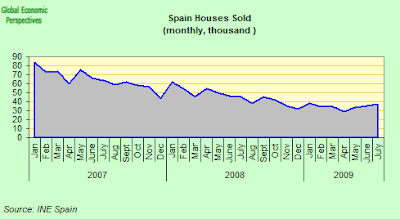 On top of this sales of weekend houses for people between 30 and 50 has halved the last 20 years indicating a shift in preferences for the next in line generation to buy houses in Spain for their retirement. On top of this they (born in the 50s and 60s) are far fewer than the present buyers (born in the 30s and 40s). Soon the first big wave of old foreigners residing in Spain will start dying and selling. – Oversupply of perhaps five million homes. 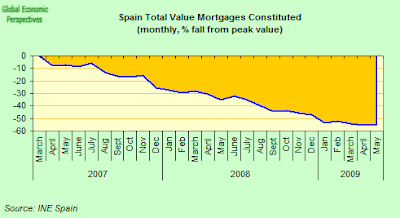 I think in real terms housing in Spain will not go above 50% of peak prices in a very long foreseeable future of perhaps 20 years.